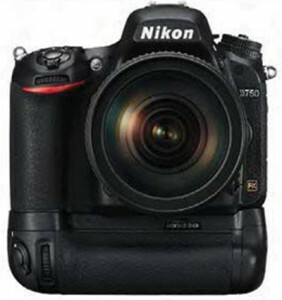 The fusion of outstanding agility and an effective pixel count of 24.3-million pixels with the excellent image quality of the FX formatIn addition to being the compact, lightweight and slim camera in the history of the Nikon FX format, the D750 offers a level of agility never before seen with a deep grip that enables a firm and steady hold that was achieved by making the camera significantly slimmer. The fusion of this agility, an effective pixel count of 24.3-million pixels, and the excellent image quality of the FX format enables greater freedom of expression and the ability to better express intent with photographic imaging, and also opens the door to new shooting possibilities. Clear, high-sensitivity performance that exceeds that of high-end models made possible by a new Nikon FX-format CMOS sensor and the EXPEED 4 image-processing engineThe combination of an effective pixel count of 24.3-million pixels, the new Nikon FX-format CMOS sensor, and the EXPEED 4 image-processing engine achieves both excellent sharpness and superior image quality. By making the pitch of each individual pixel on the new image sensor larger, a broad dynamic range is preserved, and superior high-sensitivity performance that enables rich and smooth expression of tones with very little noise has been achieved. In addition, adoption of new algorithms with EXPEED 4 achieves faithful color reproduction and minimizes noise at high sensitivities. Specifically, the D750 even surpasses the D810 in image quality at high sensitivities, and the large pixel pitch delivers advantages in definition, depth, tonal gradation and clear color. As a result, finely balanced image quality is delivered. This superior high-sensitivity performance is also demonstrated with movie recording. Full-scale specifications that pursue those of professional modelsBecause the D750 responds to the desire of active photo hobbyists to be ever more creative, it has been equipped with functions and performance nearly equal to those available with high-end models for professional and advanced amateur photographers. Advanced Scene Recognition SystemDetailed analysis of the shooting scene using scene information calculated by the 91K-pixel (approximately 91,000 pixels) RGB sensor and the image sensor increases the accuracy of automatically controlled systems such as AF, AE, i-TTL flash control, and AWB. Faces are also detected when images are framed using the optical viewfinder. Highlight-weighted meteringExposure is controlled with automatic detection of the brightest portion of the frame. This controls loss of detail in highlights (blown highlights), even when the primary subject is lit by a spotlight on a stage. Highly dense 51-point autofocus systemAdoption of a new AF sensor module, and 51 focus points covering a broad range of the frame, enables certain acquisition of the intended subject. This makes for smooth autofocusing, even in low-light conditions of -3 EV(ISO 100, 20°C). High-speed continuous shootingThe D750 is capable of capturing up to 100 shots*1 in a single burst of continuous shooting at 6.5 fps*2 in both FX format and DX format. *1with shooting of JPEG-format images. Excluding shooting of FX-format images at an image quality setting ofJPEG fine and an image size setting of Large (up to 87 shots possible). An optical viewfinder with approximately 100% frame coverageThe viewfinder built into the D750 offers better light transmissivity and colors, makes it easier to achieve optimal focus when fast lenses are used, and is brighter. An OLED has been adopted for the viewfinder display, making it clear and easy to read. A variety of movie-recording functionsA sequencing mechanism for which the same four-motor system used by the D810 has been adopted enables “power aperture” with movie recording. The D750 also responds to the needs of professional filmmakers with the ability to output uncompressed movies to external HDMI recorders while simultaneously storing them on a memory card inserted in the camera. It also offers advanced functions, such as Wind Noise Reduction and Frequency Response settings, that ensure movie recording with high-quality sound. 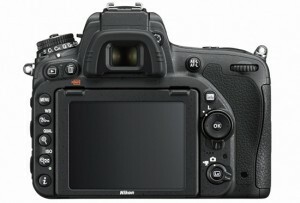 A compact, lightweight, slim, and very strong monologue body that expands shooting possibilities with superior agilityThe D750 is the first Nikon FX-format camera for which a monocoque structure, which serves as the exterior frame that protects the internal structure with great strength, has been adopted. 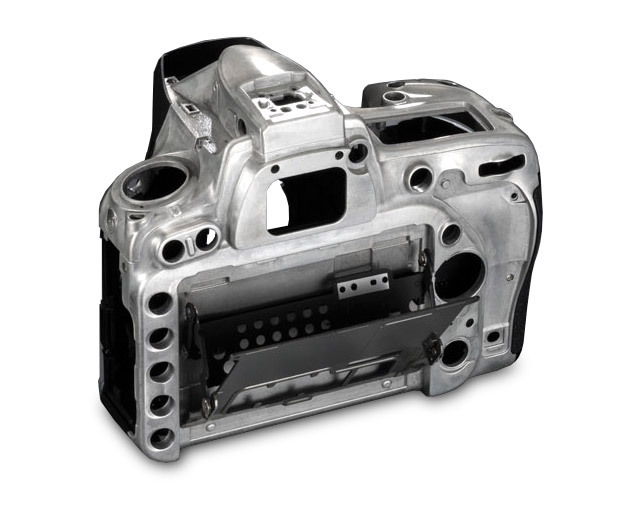 A carbon fiber composite material (new material), has been adopted for the front body, where important mechanisms such as the imaging unit are incorporated, and the front cover, and a magnesium alloy has been adopted for the rear and top covers. The first Nikon FX-format camera to be equipped with a tilting LCD monitor that supports shooting from any angleThe D750 is the first Nikon FX-format camera for which a tilting LCD monitor has been adopted. The monitor can be tilted up as much as approximately 90° and down to approximately 75° for flexible adjustment over a broad range. As the LCD monitor does not extend away from the camera to a great extent, the compact size and great maneuverability of the D750 is maintained, even with more intuitive shooting from a variety of angles. 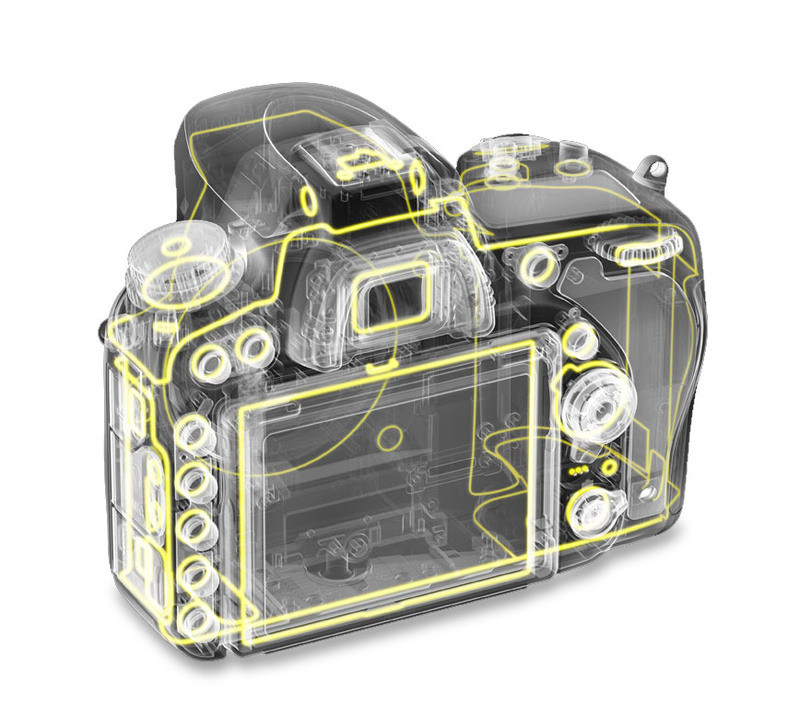 Adoption of Nikon’s original 3-axis hinge structure and a design that gradually pushes the monitor away from the camera when it is opened to face upwards prevent obstruction of the monitor by the camera’s eyepiece, even when it is opened the full 90°. In addition, when tilted downward by 75°, the monitor swings back so that the monitor won’t touch the tripod base. You can comfortably tilt the monitor even when the camera is on the tripod. The superior operation of this tilting monitor makes live view photography and movie recording fun and easy by allowing users to change the angle of the camera with regard to the scene or subject for great freedom in choosing composition. The first Nikon FX-format camera to be equipped with a built-in Wi-Fi® function for collaboration with smart devices that enables image transfer and remote shootingThe D750 is the first Nikon FX-format camera to offer a built-in Wi-Fi® function that enables wireless communication in both directions with smart devices such as smartphones and tablets. Still images exhibiting the superior quality possible only with a digital SLR can be uploaded to a smart device via the Internet that allows users to share their images with many people using social networking services and the like. In addition, the live view screen can be displayed on a smart device, enabling use of the smart device to capture not only self portraits and group photos, but also shooting suited to a variety of applications, including remote photography when the camera is mounted on a tripod. *To use the Wi-Fi® function, the Wireless Mobile Adapter Utility app (compatible with both iOS and Android™) must first be installed on the smart device. The Wireless Mobile Utility app can be downloaded (free of charge) from the smart device’s app store. 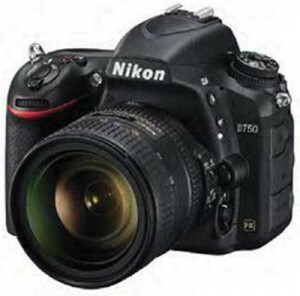 Is the Nikon D750 just an updated D610? The D750 is almost identical to the D610 in size and weight. It is 10 grams lighter and 0.1 inches smaller in two dimensions. Handling the camera is very similar with button layout only slightly changed (to match the left side buttons as on current D7100) . There are some notable improvements over the D610, many focused on video. First we have the ability to control aperture during live view, something the D610 was not capable of. Even more, we get power aperture control (smooth transition between apertures) during live view video recording with the D750. And it also has a tilting vari-angle 3.2-inch LCD screen. This is something not offered on any other Nikon FX camera. 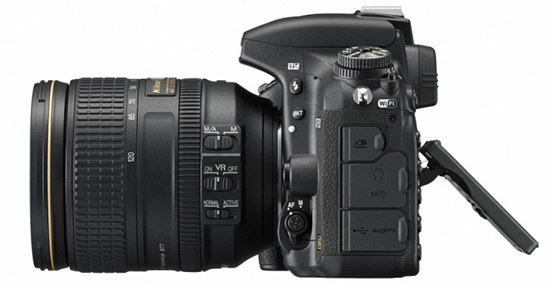 The D750 also get the new 51-point autofocus system (MultiCAM 3500FX) with group area AF as found on the D810 and D4s. 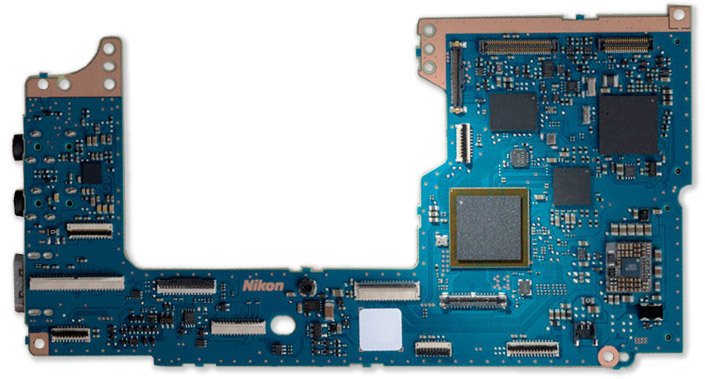 We get Nikon’s latest 91,000 pixel RGB sensor with highlight weighted mode. 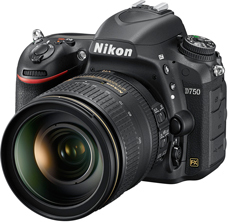 Back to video, the D750 has a menu that puts all video controls and settings in one place. There is a built-in stereo mic, a flat picture control, highlight display zebra stripes, and the ability to use auto ISO during manual mode. We get the normal frame rates in 1080 HD that we expect: 24/25/30/50/60p. On top of this, there is also built-in WiFi, another first for Nikon FX cameras. What is clear is this camera is very close to professional level specs, but is still in the consumer configuration with a mode dial, compact size and light weight. The perfect camera for many. Only the die-hard professionals may be left wanting more. 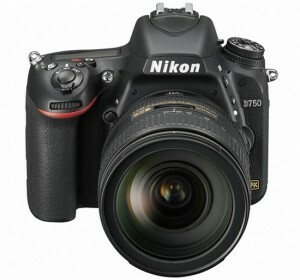 You can pre-order the new Nikon D750 to be the first to get the new camera. There is a list of retailers and offers and further information. The first “official” pictures of the new Nikon D750 FX camera have been published online. Before the official announcement, these publicity photos were found online. 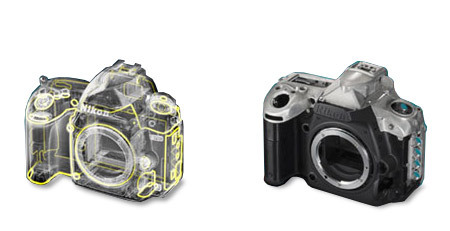 The D750 appears to be similar in size to the D610 and D7100 with a similar layout. The camera does not have the 10-pin connector on the front as some suspected. It has the side-mounted remote port instead. We also see the buit-in pop-up flash and the mode dial similar to the consumer-series cameras (D610, D7100). 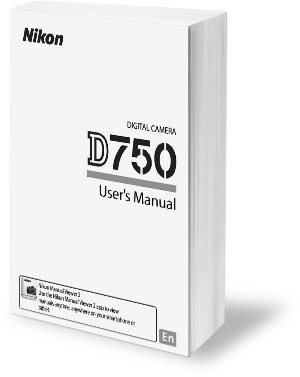 The D750 will be announced tonight, and as soon as it is official, you will be able to Prerorder the D750 online. Be sure to keep checking back for more details, they will be posted throughout the day and night.